Oscillatory or pulsatile flow in microfluidic devices is usually imposed and controlled by external electronic or mechanical actuators, limiting the chips’ portability and increasing the complexity of their control. 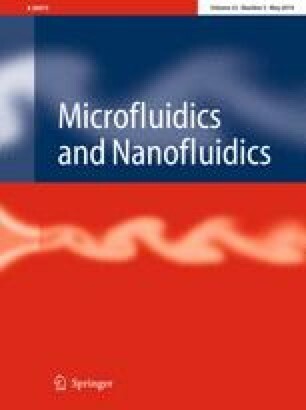 Here, we have developed a microfluidic platform that generates an oscillatory motion in a fluid with zero-mean flow, using a continuous stream of droplets as the pulsatile power source. The passage of each droplet produces an oscillatory flow in an orthogonal channel that we use to periodically force an interface between two non-miscible fluids. A detailed analysis of the dynamics of the pulsatile fluid interface revealed that its dynamics is dominated by a single oscillatory mode with precisely the same frequency of the passing droplets. As the droplets were formed by syringe-pump-driven flows of water and oil and because their frequency production can be easily controlled, it was possible to impose specific oscillatory frequencies to the fluid interface. By studying the interface movement, we propose a simple way to estimate the pressure drop caused by the flow of each droplet. This work represents a new way to produce pulsatile flow employing only continuous flows and it is an example of a microfluidic functional device that requires minimal external equipment for functioning. The online version of this article ( https://doi.org/10.1007/s10404-019-2237-7) contains supplementary material, which is available to authorized users. A.T. acknowledges financial support from Consejo Nacional de Ciencia y Tecnología (CONACyT-México) through fellowship no. 245675. All authors acknowledge financial support from CONACyT through Projects nos. 219584 and 153208. E.C.P. and L.F.O. acknowledge financial support from Facultad de Química UNAM through PAIP nos. 5000-9011 and 5000-9023. ECP conceptualized the project. PAB performed the investigation. AT carried out the data curation and formal analysis. ECP and LFO did the funding acquisition and supervised the investigation. AT, ECP and LFO wrote the original draft, performed review and edited the final manuscript.